The Boogie returns to June in 2020. June 13. Usual second Saturday in June. registration will open January 1, 2020. 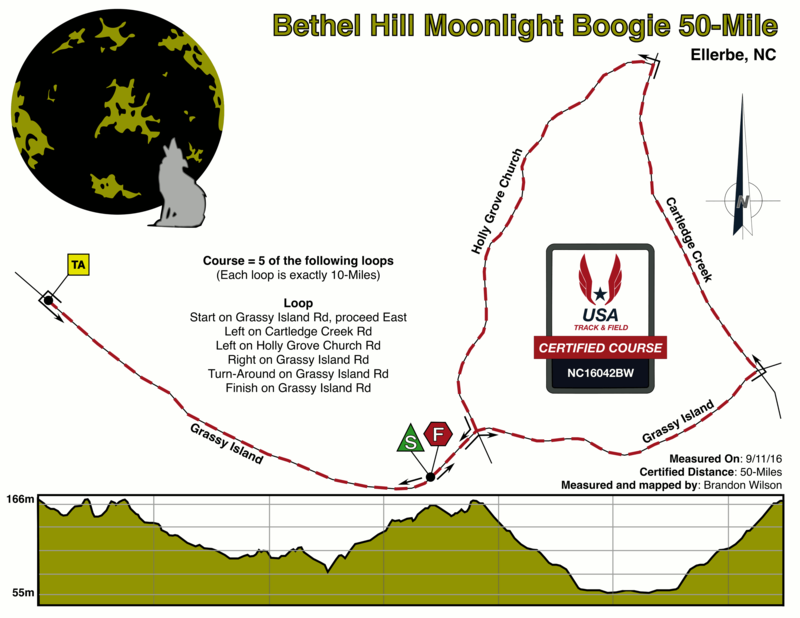 "THE BETHEL HILL MOONLIGHT BOOGIE"
"Come with no expectations and you will not be disappointed." comes about 8:15 p.m. and there are no street lights. You will need a light for the reasons cited in the waiver. away. Find an easier event. start marathoners will make a left turn and do an out-and-back that is necessary to get the distance correct. Location: About 6 miles west of Ellerbe, N.C. Click here for directions. running all night you may not need a room. under 10 1/2 hours. Marathoners must be finished by 2 a.m. [9 hrs. time limit]. All participants must wear a headlamp or other light and run with it "turned on" after dark. No strollers allowed. notify either the race director or the chief timer. Medical personnel will be stationed at the church aid station. In the event of an emergency on the course, first call 911 and then notify on site personnel at the aid station. by March 17 to have a shirt included. Shirts will be presented at packet pick-up. 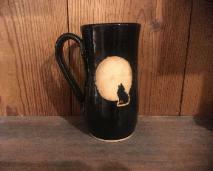 and get yours at the finish. distances will be recognized as finishes. The 50 mile has only a 50 mile finish. Anything less is a DNF. meat will be served at either station. pen will have water and a few items along with the usual characters. No hot food at the dog pen. ketchup, crushed potato chips, salt or jalapenos. Burgers will be warm and toppings added at your request. Burgers available at 7 p.m..
5 p.m. 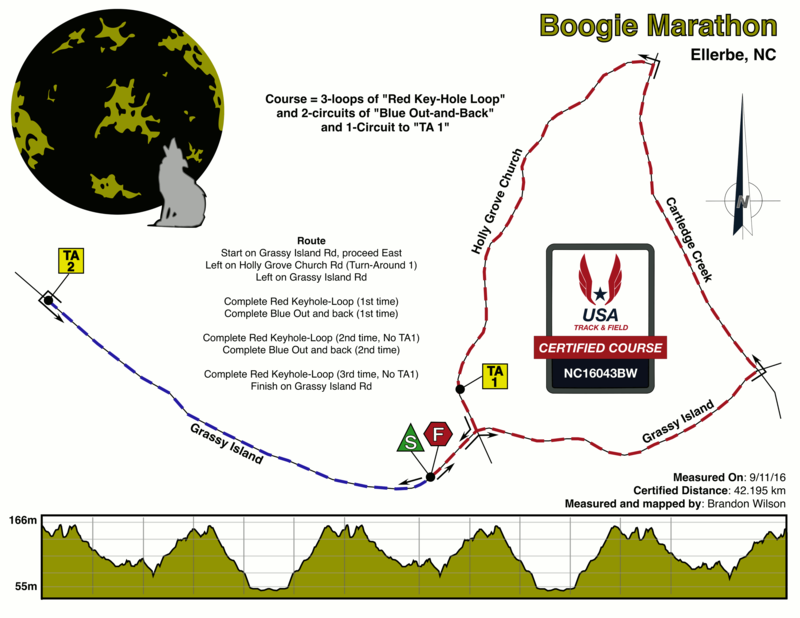 Most runners will finish the first loop in daylight. All runners will be required to have a light after dark. The course is open to traffic, so the lights are not only for you to see with, but also so you can be seen. location for the Boogie. Please do not do anything that would cause me to lose this location.